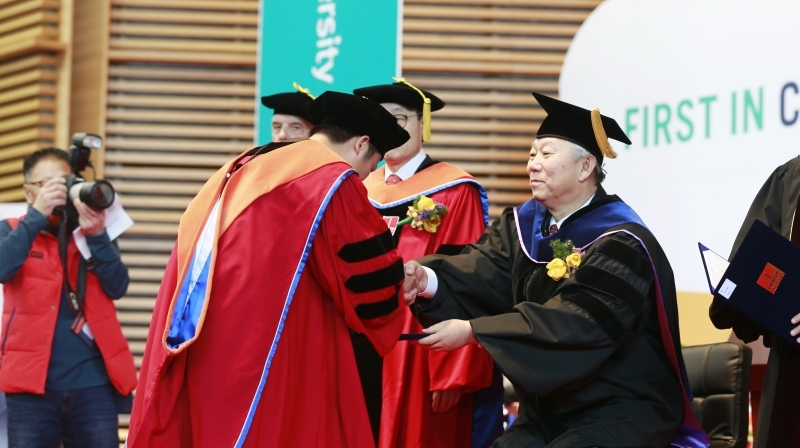 President Mooyoung Jung shakes hands with each graduate as he presents them with their diploma during the 2016 commencement. "Don't be afraid to dream big, but remember that dreams without goals are just dreams." 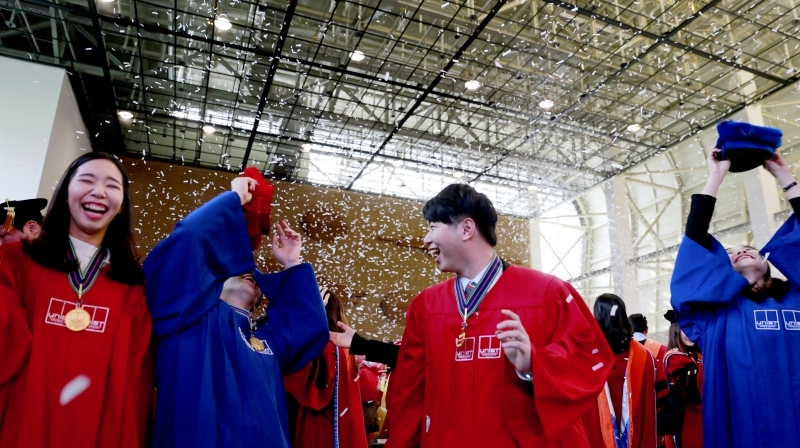 At the 2016 UNIST Commencement Ceremony, President Mooyoung Jung emphasized the importance of being humble and being able to relate to others because today’s society wants outstanding individuals who can communicate and cooperate with others. 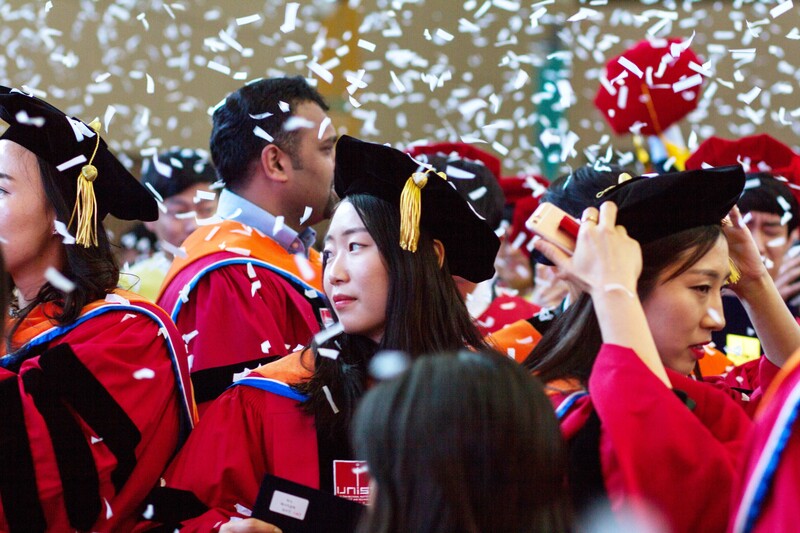 Today, we are gathered here to congratulate the 509 undergraduate students, 105 graduate students, and 44 doctoral students, who have earned their degree. First, for all the graduates who have worked hard these past years to fulfill and achieve their ambitious dreams, I want to congratulate and wish you great success in your future. In honor of your graduation, I want to give respect to your parents for their love and sacrifice to support your studies. 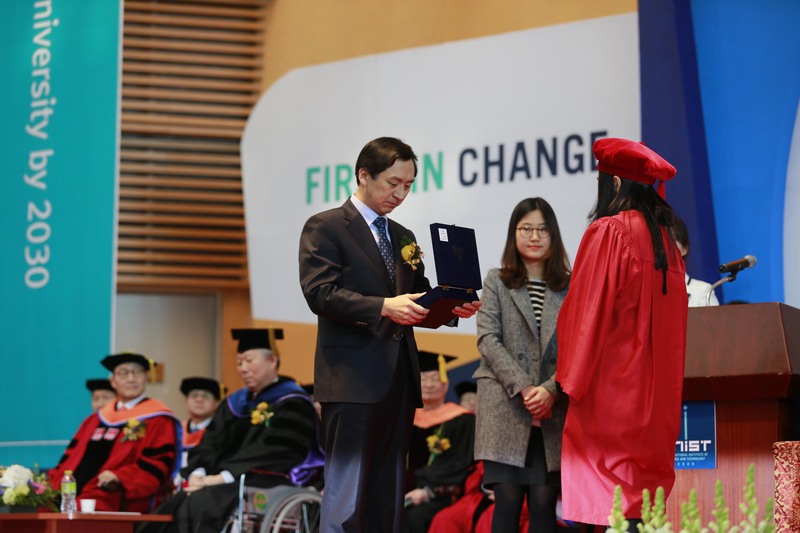 In addition, I want to thank the professors and staff members who worked hard to assist you for your bright future. 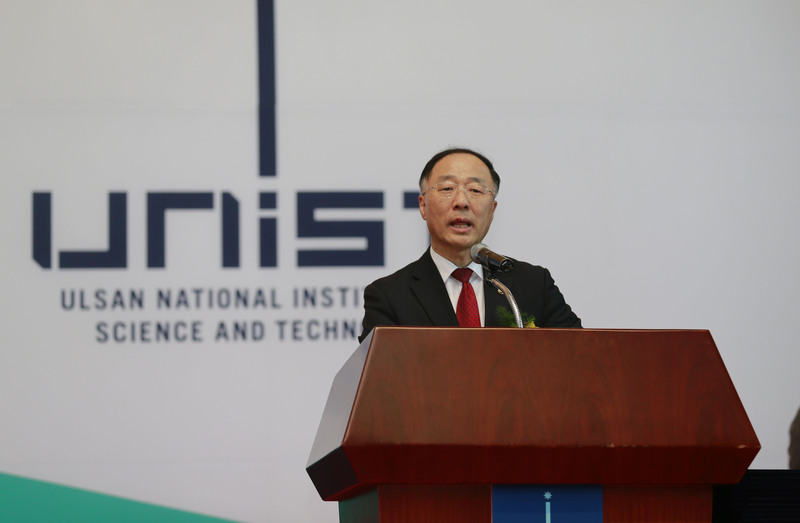 Furthermore, I want to thank Mr. Hong Namki, the First Vice Minister of Ministry of Science, ICT and Future Planning; Mr. Kim Gi-hyeon, Mayor of Ulsan Metropolitan City; Mr. 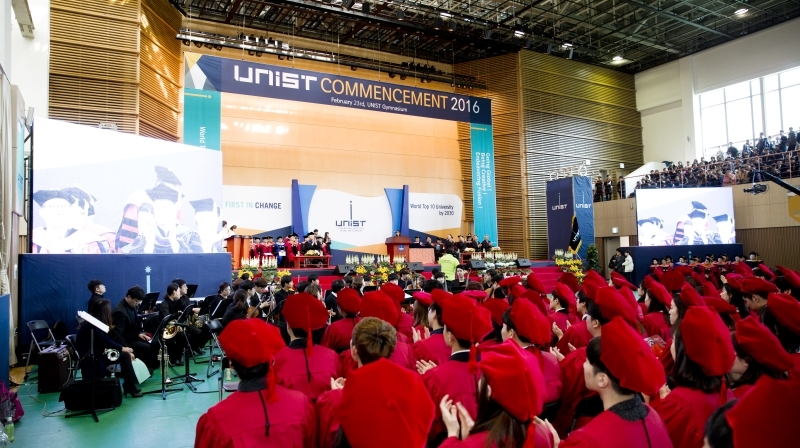 Pack Yeong-chul, Chairperson of Ulsan Metropolitan Council; Dr. Kim Bok-man, Superintendent of Ulsan Metropolitan Office of Education; Dr. Lee Hyun Soon, Chairperson of the UNIST Board of Directors, and our distinguished guests who are here today to brighten the commencement ceremony despite their busy schedules. To the proud graduating students! Now that you’ve become accustomed to university life, it’s time to put it behind you and embark on a new voyage. To have your dream life, and to be a productive member of society, is like sewing your first button. However the new world that is waiting for you is not always rosy. As the world is borderless and very competitive, everyday new ideas and technologies are created while yesterday’s new technology becomes obsolete today. It is not just science and technology that are fast paced, society itself is also changing very quickly. Today I would like to make several requests to you who are dreaming to become global leaders and ready to step onto the global stage. First, challenge yourself and have a dream. Have a dream to achieve. As you set your dream, you have to picture yourself 10 years and 20 years down the road. Also, while making your dream into reality you will be discouraged and experience failures. However, do not be afraid challenge yourself and go forward. When you are afraid of failure you cannot achieve your dream. Winston Churchill once said these famous words at an Oxford graduation, “Don’t give up, Never give up, Never never give up”. As you go through life, you will fall and stumble. You will face many difficulties, but I request that you challenge yourself, dream, and persevere. Second, be humble and have consideration for others. Today’s society wants outstanding individuals who can communicate and cooperate with others. Society will not accept individuals who think they are always right and disregard others. In an intensely competitive society, you have to be humble and help others who are less fortunate, and then yourself will shine and be more valuable to society. Lastly, do not rest on your laurels. Graduation does not mean the end but the start of the next part of your education. Until now you have relied upon guidance from professors at UNIST for your research and experiments. Now you can set course for a new world of research. Today’s society consists of information technology and globalization. New knowledge and information is conceived every day. Today’s new knowledge can be obsolete tomorrow. If you stop learning and advancing for even one moment, you could fall behind and lag. As you graduate today, be proud that your alma mater UNIST will always be there with you in your new journey. UNIST was established in 2007 with cutting edge research facilities and education by inviting the world’s greatest scholars, thus leading to its rapid development. 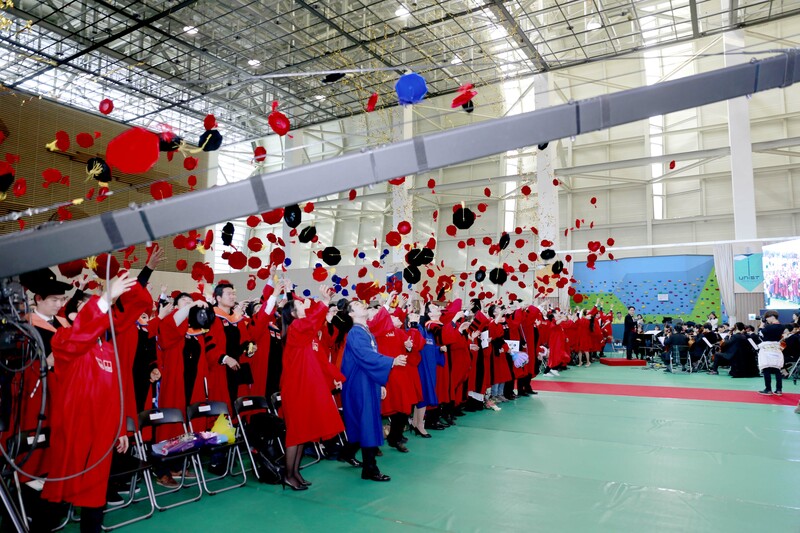 Especially with hard work and effort, we changed into an Institute of science and technology as the first step towards becoming a global science and technological university. As you go out into society, all members of UNIST will continuously work hard and become an institute you will be proud to have graduated from. I hope you always think of and give support to your alma mater as it develops into a global university. Once again I want to congratulate you on your graduation and wish you good health and luck in the future.